Four rare panoramas of Kyoto by famed illustrator Hiroshi Yoshida. 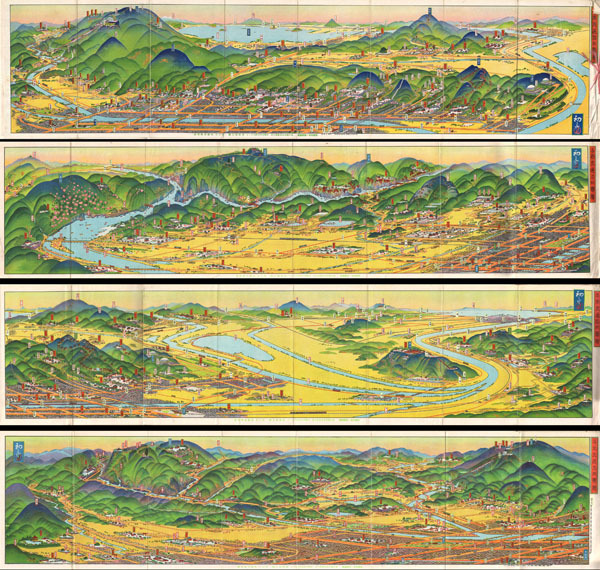 A rare set of four maps of Kyoto dating to Showa 3 or 1928. Drawn by the famous Japanese illustrator and print maker Hiroshi Yoshida these maps are representative of a style of map that developed in Japan in the early 19th century. Essential transport and rail maps, each of these panoramic views displays a different part of Kyoto - North, South, East and West. Each of the four panels is 7 x 29 inches. All text in Japanese. Color lithograph process. Drawn by Hiroshi Yoshida and published by the Kyoto Education Council. Hatsu Saburo Yoshida (March 4, 1884 - August 16, 1955) was a Japanese illustrator and painter of birds-eye views active during the Taisho and Showa periods. Yoshida was born in Kyoto and apprenticed under Takeshiro Kanokgoi (1874 - 1941). Yoshida is significant for pioneering the use parallel perspective birds-eye views to illustrate Japanese bus and railroad transit networks. His first birds-eye view, completed in 1914, illustrated the Keihan railway and was highly praised by no less than the Emperor Hirohito himself. With the Emperor's approval, Yoshida's views became widely popular and were adopted by the Ministry of Railways for the illustration all of its major public transportation networks. Most of his work thus consisted of city and regional views, though larger views encompassing the entirety of Japan do exist. Yoshida's most significant piece is most likely his rendering of the Hiroshima bombing, which was published in an English language magazine in 1949. Yoshida took on Tsunemitsu Kaneko as an assistant and apprentice in the early 1930s. Eventually Kaneko started making parallel perspective views of his own and became Yoshida's primary rival. Good condition. Each of the four panels exhibits minor wear on its original fold lines. Original yellow art deco binder is included but worse for wear with half of its cover missing.